Last winter we had a glut of beetroots from our kitchen garden. 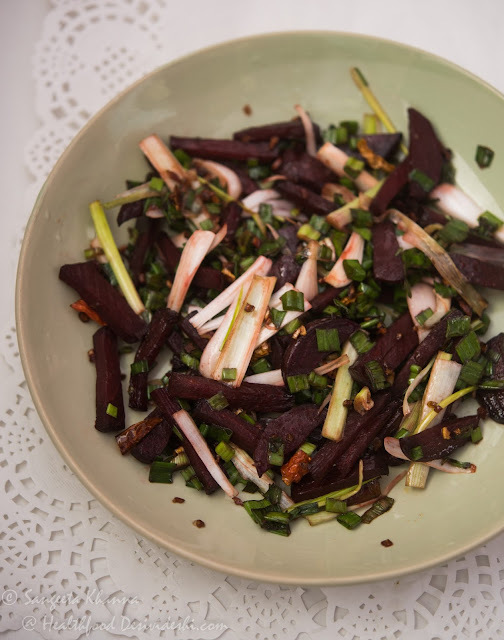 I had to discover new ways of eating beets and I figured the sweetness of beets combined with this unique earthy flavour needs some umami to bring out the best from them. 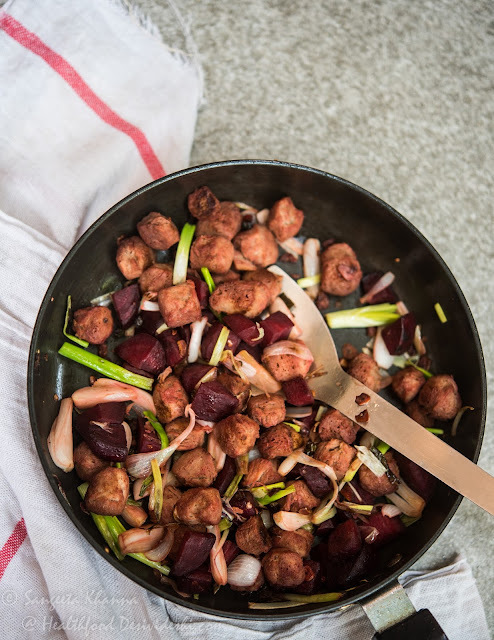 This beetroots and soy nuggets stir fried with a dash of soy sauce and loads of spring onions worked like a charm. To be honest it was only eaten raw back home when we were growing up, just as a part of the sliced salads with cucumber, tomatoes and onion rings and we never actually liked it. It was eaten because the parents said it was good for us. 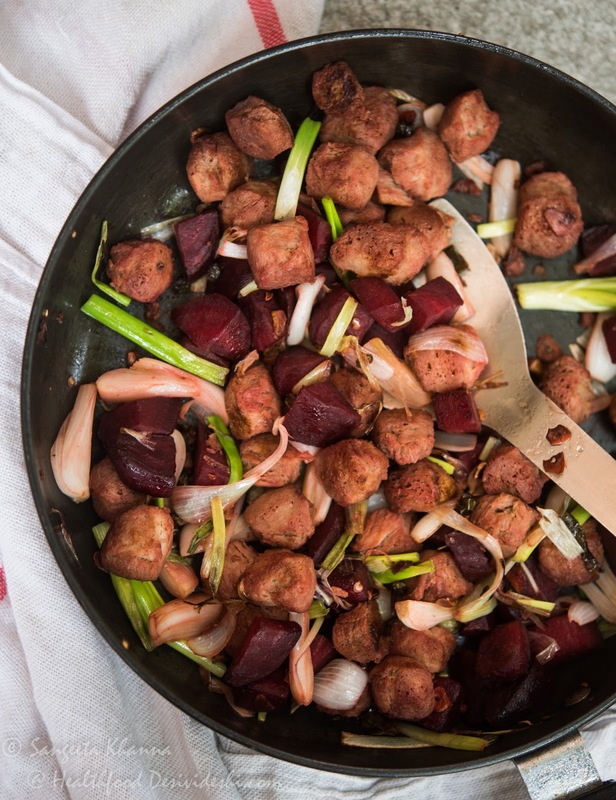 This beets and soy nuggets stir fry became such a success that I started making it about 3 times a week and sometimes would use grated beets and soy nugget mince to make it suitable as a stuffing in wraps, sandwiches and parathas. Any produce from the garden feels like God's gift and I can't imagine not using it to the hilt. I even used the fresh leaves of beetroots as they have better nutritional value than the roots in many more ways, sometimes adding them to chhole or rajma and sometimes making a palak paneer type curry with beet leaves. Actually the leaves have so much minerals, antioxidants, vitamins and fibre and no carbs like the roots. The bottom line is, garden produce is not to be wasted at all. Heat oil in the pan and tip in the garlic and green chilli mince, let it fry for a minute. Add the beetroots and stir fry for 2-3 minutes on high heat. Add ginger if using and the soy sauce. Toss to mix. Now add the soya nuggets, pepper powder and sprinkle some water so the soy nuggets absorb all the flavours. Cook covered for 4-5 minutes on medium heat, stirring or tossing once in between. Do not cook the beets too much and retain a bit of bite and crunch. Add the chopped spring onions, toss and mix and let them wilt before taking the pan off the heat. Serve hot like a meal or with roti, paratha or any other kind of bread. It can be a good side dish if you are cooking for an elaborate meal. The same stir fry can be made without the soy nuggets too and I am sure you would like it this way too. Chopped into thick batons the beets make a good looking dish on a table. It can be served like a salad or subzi as per choice. It is worth telling you all that after the last year's beetroot crop and eating beetroot so much, Arvind made sure we sow some more beets this season. Now we are expecting good yield this season too. It is such a blessing to get fresh food grown in one's own garden. Thank you Shail ...such positive feedback is always cheerful...this is the most loved beets recipe at my place.